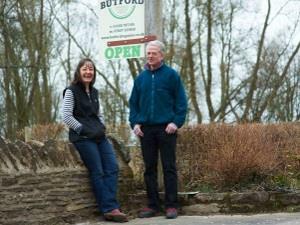 Butford Organics07807 333950workGuided TourCider has been made at Butford Farm for many a long year – one of our barns boasts a 300 year old cider mill. To carry on this heritage, Janet and Martin Harris planted their first fruit trees in 2000 – a millennium orchard of cider and dessert apples, perry pears, plums and walnut trees which is now in full production. The harvest in 2015 was the best ever. This was supplemented by the acquisition of a mature cider fruit orchard in the next village and the planting of a perry pear orchard, with over 15 varieties, which will very soon supply all our perry pear needs. We are certified as organic by the Soil Association and produce our cider and perries with as little intervention as possible – we only use wild yeasts and do not add sulphites. We make a full range of ciders and perries from still draught to sparkling bottle conditioned as well as named variety apple juices. Every part of the production process is done by ourselves here at the Farm thus ensuring quality control from harvesting to relaxing with that satisfying glass of cider. •	We have won best sparkling perry at the International Cider and Perry competition at the Hereford Cider Museum 3 times in the last 8 years with our Aurora perry. •	Most recently we have been awarded best product in the cider/perry category of the 2016 Bolton CAMRA Festival – for the second year in succession. We are delighted to show visitors round and arrange tours and tastings. Our Farm Shop is open on Fridays and Saturdays and most Bank Holidays. For those who want to learn more we run cider-making courses in the autumn. Both these and all our products can be purchased online through our website. Cider has been made at Butford Farm for many a long year – one of our barns boasts a 300 year old cider mill. To carry on this heritage, Janet and Martin Harris planted their first fruit trees in 2000 – a millennium orchard of cider and dessert apples, perry pears, plums and walnut trees which is now in full production. The harvest in 2015 was the best ever.